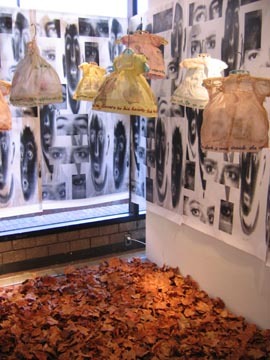 The Poisoner’s Kiss is an installation comprised of altered doll dresses floating above a blanket of fallen leaves to suggest a forest of childhood memories. Each dress displays a classic fairy tale quote embroidered around its hem, and is printed with iconic images that reflect the quote. The quotes reflect the darker side of the tales, the anxieties of childhood, and fear of the unknown that colors childhood un-romanticized reality. The background murals are images of the eyes of street children, witnesses, unable to speak.